The Agency Board of Directors voted Wednesday, September 19, 2018 to approve financing incentives for One North Depot in the City of Binghamton. The measure was approved unanimously. 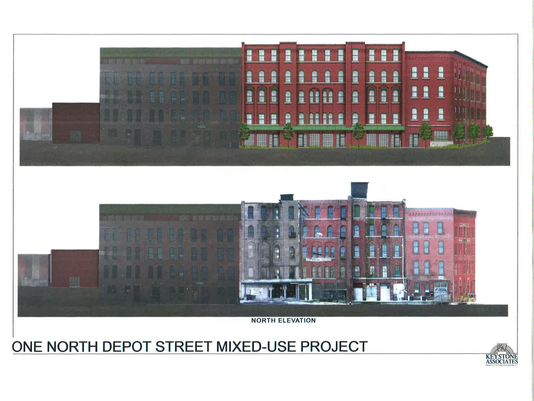 The One North Depot mixed use development is located in downtown Binghamton at 1 North Depot Street. This development project will provide affordable commercial space, housing, shared work space, and new green space close to the urban core of Binghamton. One North Depot will be comprised of at least 5 units, 11,000 square feet of commercial storefront and office space, over 8,000 square feet of shared work space for small businesses, and entrepreneurs, 10,000 square feet of outdoor green space, and 55 units, 40,500 square feet of residential upper floor housing, mostly in the form of 1-bedroom loft apartments. The total project cost and investment in Downtown Binghamton is approximately $11.5 million. This includes $3 million in equity from the developer; a $2 million Empire State Development grant; and roughly $6.5 million in loans. Josh Bishop, the developer of One North Depot feels the primary goal of the project is to “attract new jobs, new small business, and to attract and retain skilled workers to the vibrant Binghamton area”. The One North Depot mixed development project was supported and ranked as a priority project with the REDC. This housing project will address a need for market rate housing in downtown Binghamton along with attracting and retaining young professional in the area.